I share my home with Shayne, Rio, Bandit (my mom’s dog), Panther, Monty and Jefferson — plus the occasional foster dog. It can be a bit much in terms of the number of critters that share the space but I am extremely fortunate that managing this bunch is actually pretty simple. There are many homes and situations with multiple pets/dogs that require different degrees of management to run smoothly. When talking about multi-pet homes, there is no one-size-fits-all picture of what a home should look like. Depending on all the individuals involved, each house will look different. One is not any better than the other — they are just different and suited to each individual set of pets. When there only the six resident animals are in my house, the level of management is pretty low. With the exception of one incident between Shayne and Panther a year ago (in a very specific circumstance that is strictly managed), there has not been a single scuffle, snark or concerning incident between anyone. There are very rare (once with Shayne and once with Rio) moments of yucky face resource-guarding over food items but it has never escalated beyond a snarly face and small growl. When I am home, all the critters have access to one another. The dogs can all have resources together (though they go to separate areas on their own), they have access to toys/chews and they come and go as they please. The cats have wall shelves, cat towers, window perches and a gated off area so they can always get out of the way of the dogs if it gets rowdy. I manage the play level and don’t allow picking on anyone but it’s pretty harmonious. Although they live completely peacefully when I’m home, I still have a very low-level management routine in place for when they are left unattended. Since they have never had any scuffles or issues, the dogs are left unattended together in a gated off section of the house. The cats have access to the dogs’ area but most of their favorite sleeping spots are outside of the area so they aren’t together too much when we are not home. Even though there have never been any indications of problems, there is still risk in leaving six animals together unattended. Given that there has never been so much as a serious disagreement between them the risk is low, but it still exists. The risk for issues is drastically greater when there are foster (or new) dogs in play. These dogs are new to the mix and do change the dynamics of the group. All but one of my foster dogs were with me for more than three months–some as long as seven months. All of the dogs, except for Linus because of his separation anxiety, were left separated from the rest of the animals when they were unattended. There was too much risk of a fight happening with the unknown dog in the mix to leave dogs together (even if they had been with me for six months). As previously mentioned, there are many homes that require a higher level of management to keep everyone safe and happy. Some homes only function on a strict separation protocol when left alone — all dogs are crated or securely separated from other dogs/cats in the home. Some homes may even have this type of separation protocol for when the dogs are simply unattended — if you are in the shower or in the garage/basement working, the animals are separated. There are some situations where only certain dogs must be completely separated but others can be left alone together. Perhaps it’s only a matter of separating the dogs and the cats when left alone. It all will vary and depend on the individual dogs and the specific situations. I take into account the history of the dogs (any disagreements/scuffles/fights), how long they have been together, any known behavioral problems, size differences, breeds and general vibe in the house when I’m choosing what type of management is needed when dogs are left unattended. A household with three adult dogs who have been with each other for years. One of the dogs has a history of resource guarding toys, trash or couch space. The guarding hasn’t result in serious injuries but there have been some physical disagreements. I would not be leaving these three dogs alone in the house together. The risk of things escalating without me there to step in quickly would be a risk that I wasn’t willing to take. Since the dog who resource guards does so with a wide variety of resources, it’s not as simple as leaving them without food items. If there was a single dog who was resource guarding, I may crate or gate that dog separately and let the other two hang out, or I may separate all three. With three dogs in the house, when two dogs get into it, many other dogs would jump in on the melee and gang up on the weaker dog which can result in serious injury or death of a beloved pet. A household with two dogs — one is a dog who was adopted/purchased a few months ago. After a rough several days immediately after adding the new dog (no injuries, just some posturing), the dogs have seemed fine together. No known issues of resource guarding. I would not leave a newly adopted dog home alone together with the resident dog. It can take newly adopted/purchased dogs 2 – 4 months to fully settle into a home, let alone be trusted with the resident dog. Add to that concern the fact that it sounds like the initial introduction wasn’t necessarily ideal I would be even more cautious. (I would have suggested a two-week shut down for the newly adopted dog, instead of going right to meeting the resident dog.) I would make sure to have both dogs separated when I was not home to monitor interactions. Puppy Rio had been with me for about five or six months before being left alone with Shayne (with no history of any issues between the two). 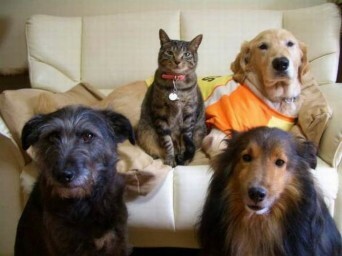 Two dog household with adult dogs of similar size and two cats in the house. These dogs have lived together for years. While they are typically good together, they have a history of a few disagreements that resulted in some minor injuries — maybe a few minor lacerations to the face or maybe a torn ear needing stitches. Both dogs love the cats and there have been no problems between dog and cats. Although they are fine together most of the time, the fact that there is a history of scuffles/fights that led to blood being drawn would lead me to make sure both dogs are separated from one another when left alone in the house. There is a good chance that the prior scuffles were quickly broken up when I stepped in — if I wasn’t there to step in who knows how fast they would escalate and what type of damage could be done. Since both dogs have shown no problems with the cats, I would be comfortable letting the cats roam as long as the dogs were separated. A home with three dogs of varying ages. One of the dogs is either old, frail, deaf, blind, ill, injured or fearful/anxious/insecure. None of the dogs have a history of any concerning behaviors with another resident dog. I would be separating the old, frail, deaf, blind, ill, injured or fearful (etc.) dog from the others (assuming the other two have no history of concerning behaviors, they would be left together). Dogs that are deaf or blind can have an exaggerated startle response that could lead to a fight in any number of situations–these responses can be totally out of the blue and contrary to the normal group vibe. Fearful, anxious, or insecure dogs can easily overreact to situations that don’t warrant a high response–another dog barks or growls in their sleep while dreaming and the fearful dog reacts defensively causing an issue. Dogs that are old, frail, ill or injured may be more defensive because they know they are not ‘well’ or they can be easy pickings for the other dogs if something were to spark a disagreement or spark an increase in arousal/stress level (door bell rings, car back-fires, thunder storm, etc). The most important thing to remember is that there is risk involved when leaving animals alone together. The risk in some situations is pretty low but the risk in others is pretty high. Dogs are capable of seriously injuring or even killing other dogs/cats in the home–if things go wrong, they can go really wrong. It is extremely important that pet owners are making safe and educated decisions on the management protocol in the house. You have to set a management protocol for the dogs/cats that you have, not necessarily for a house full of perfect Lassies. I’d love to be able to give the dogs full run of the whole upstairs in my house, but the fact is I have two dogs who are food hounds that will extreme counter surf and open doors to get into things — so, because of their history they are gated into a few rooms that have no food in them. It’s okay if a more strict management plan is needed to assure all the dogs/cats remain safe–it’s not a reflection of you as an owner or your dogs as animals. Tena Parker M.S., has been working with dogs for over 10 years. She is the owner of Success Just Clicks Dog Training in Pittsburgh, PA, has a thriving daily dog blog online, is a member of the APDT (Association of Pet Dog Trainers), is a Certified APDT C.L.A.S.S Evaluator (and instructor), is a Certified AKC Canine Good Citizen and S.T.A.R. Puppy Evaluator, and is a Certified Mentor Trainer for Animal Behavior College. She also teaches popular dog training classes through Western Pennsylvania Humane Society’s Get Smart! Training School several days a week.